KEF T105 review | What Hi-Fi? While some style speaker packages grab your attention with curvaceous cabinets and glossy finishes, others try to shy away from the spotlight. Take the KEF T105. Unbox this system and the first thing that you’ll realise is that the T101 satellite speakers are ridiculously thin – just 3.5cm, to be precise. Once they’ve been wall-mounted alongside a flatscreen TV, they simply blend into the background – and make all the other packages in this test appear positively intrusive. If you don’t fancy attaching them to a wall, you can use the supplied tabletop plinths, which let you adjust their tilt accordingly. The centre channel sits horizontally (the driver arrangement is still identical to the four other satellites), propped up by a slot-in strut. A pair of tiny Allen bolts hold your bare-wire speaker cable in place. To help achieve their wafer-thin proportions, the T101s don’t use the likes of NXT flat panel technology, which you might expect. its traditional Uni-Q drivers, which can be found in its conventional speakers. Even the accompanying T-2 subwoofer is much slimmer than the other bass boxes on the market. 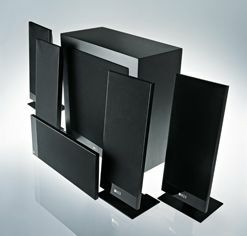 But, if you thought that KEF had to make one or two sonic sacrifices to make the speakers this thin, you’d be wrong. For starters, the satellites display a remarkable sense of cohesion, whether they’re hung from walls on the supplied mounts, or positioned on their tabletop stands in a little free space. They manage to generate a broad, lavishly layered and utterly involving surround field, and are just as happy filling larger rooms as smaller spaces (where their design comes into its own). the KEFs communicate the power and brute force of the metal behemoth as effects are shifted from speaker to speaker with a real sense of depth and direction. Dialogue fed through the T101c centre channel sounds natural and full-bodied – which is no mean feat for such a slim speaker. We wouldn’t necessarily recommend listening to music through just a pair of these satellite speakers. There’s no wince-inducing treble to speak of, but there is a lack of substance unless you include the subwoofer in proceedings. But even then, spin a CD or music Blu-ray and there are other systems that boast a superior sense of musicality and timing. The subwoofer in particular doesn’t quite have the agility and poise of the very best. Nevertheless, as a stylish, discreet and extremely capable surround sound solution, the T105 will serve you extremely well. It’s a triumph of form and function.